Just short of a year’s time, yet another covert victim of what is nearing a million are reporting being placed into a high level, highly technological harassment program, succumbs by suicide, broken by relentless covert technological harassment. If a lot of people are saying the same thing listen. People are saying the same thing, nationwide and globally regarding a MONSTROUS, inhumane, unjust program using human beings as lab rats in operations so viciously heinous, most cannot believe it is happening or that there is an actual very real highly secretive program unleashed. The objective is, based on the untold number of victim reports, is 100% designed to push the target over the edge, to suicide, entrapment, with relentless denigration, death threats, isolation, and covert destruction of the victim’s life, livelihood, and all relationships, homelessness, and of course, it must be done COVERTLY. The 24 hour a day, 7 days a week covert victimization is a high-powered strategic effort of relentless physical and verbal attacks, intense harassment and coercive Directed Energy Weapon pain beams used as barbaric physical torture by cooking the human body like a piece of meat in a microwave oven and documented to have a gradual slow kill effect when used in this manner. This is although the Military Industrial Complex as labeled these high-powered weapons “Less than lethal” or Non-Lethal” which is an intentional misnomer. Victim’s report being told around the clock, by through the wall radar of their worthlessness, told to commit crimes and the torture and harassment will story, and the degradation designed to break the victim is reinforced by vicious names called them also many reports. Many have documented high-tech beamed suggestions from operators to “kill yourself” as well as reports of threats that if the victim does not submit, in some way, that those at the helm of the technology will kill them while again being viciously tortured by Directed Energy Weapon intent to drive home a very real covert capability and scare the victim into submission or action. Both men and women also report, unwanted high-tech sexual stimulation especially for women by the men working these operations which is a well-known patented capability, by inventor Hendricus Loos, using patents that manipulate the nervous system and create a specific effects, as well as other methods, such as dream manipulation, sleep deprivation hoping they will crack, as stated, after strategic isolation and destruction of all relationships. The victim then is placed into an organized community stalking program of community recruits, everywhere the victim goes. And, incredibly it is mobilized and overseen from a highly advanced, highly technical operation center which is numerous across the USA today, two to three in every state, and globally, or can be as close as makeshift neighboring locations set-up by these operatives. Sadly, some can’t take the powerful covert crucifixion and have learned there is nowhere to turn for help. Where do you turn when this is an official, unofficial human high-level government agency combined with military technology and military personnel bogusly legalized experimentation program? In fact, Dr. Robert Duncan, author and once insider turned whistleblower, employed by high-level government agencies involved in constructing the electromagnetic technology unleashed today within the public domain. He confirms that this is a Goliath of which has been systematically established so it cannot or will not, those involved hope, be revealed. Harold Brown‘s father just texted me saying that Harold committed suicide 5 days ago in Garland, Texas. His funeral will be in the near future for anyone interested in going. This is terrible news and my prayers are with Harold and his family. I’m not sure if you knew or not but, I just found out this news. 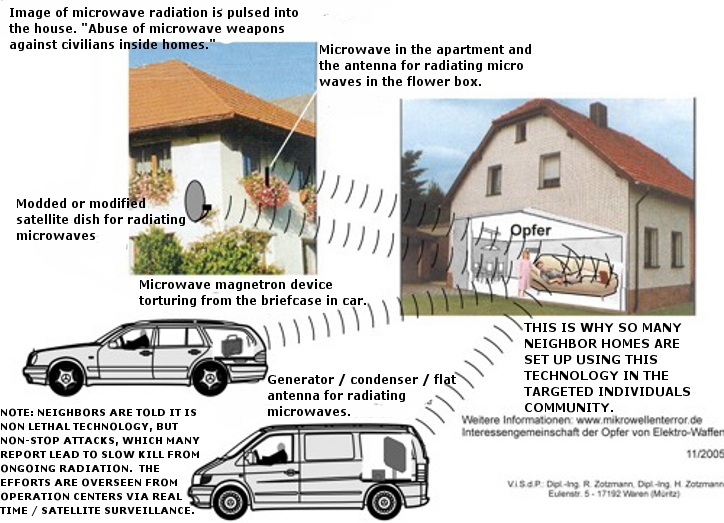 The above image is an ‘example only’ of various methods being reported for microwave directed energy weapon attacks making the attacks intentionally up close and personal. Victims of these high-tech non-consensual technology testing operations backed by military mind invasive technology, continually report being engulfed by powerful waves of high tech depression beamed to them and it is a feeling so intense that many have had to continually battle the feeling with positive thoughts and affirmations or refocusing the best they can on loving thoughts during the powerful attacks. However, when combined with the covert destruction of a victim’s life, to penniless, this becomes an unbearable challenge. DESCRIPTION: A system whereby the target’s electromagnetic frequency is monitored remotely and EEG results fed back to them (or others) to mimic emotional patterns; e.g. fear, anger, etc. In other words supercomputer’s clone, your emotions then beam them back to you to induce fear or panic to control you at an opportune time. PURPOSE: To induce emotional/psychological responses. For example, the feedback of Delta waves may induce drowsiness since these are familiar when in deep sleep. Delta Programming is also used for Manchurian Candidates. The magnetic field around the head, the brain waves of an individual can be monitored by satellite. The transmitter is, therefore, the brain itself just as body heat is used for “Iris” satellite tracking (infrared) or mobile phones or bugs can be tracked as “transmitters.” In the case of the brain wave monitoring the results are then fed back to the relevant computers. Monitors then use the information to conduct “conversation” where audible Neurophone input is “applied” to the target/victim. Many victims described the intense feeling when your stomach sinks in great fear, sadness, resulting in high-tech, synthetic, great and unbearable, pain or sorrow. Some are held in this manipulated frequency for days on end. 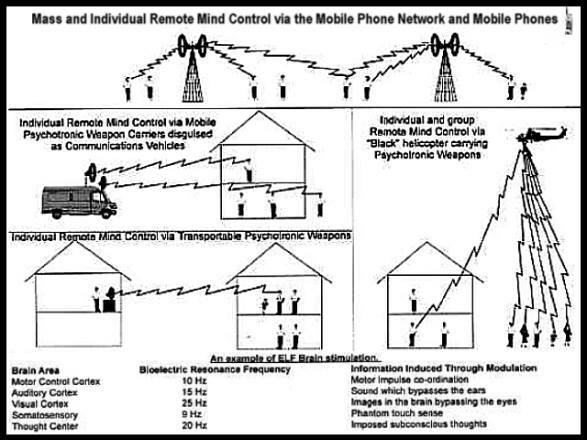 The fact is, technological mood management, from radio frequency technology, is well-known and documented by the Military Industrial Complex, and is also well defined as a capability also in failed Congressman Dennis Kucinich’s Space Preservation Act of 2001 in Section 7 as shown below. Without a doubt, this technology is no joke and is in full use today, open literature evidence reveals, as well as again, reports, backed by victim after victim, after victim who have suffered for years, as well as testimonies of highly credible, once insiders, activist and whistleblowers within the USA and all over the world. All report the same thing, that it can be very intense, effective, and an overpowering form of negative mood management, especially true, when typically, cleverly, backed with ongoing, relentless, malicious harassment, and again energy weapon torture. This is the operative’s main focus, the reason they hide, being an ongoing attempt is to push the victim over the edge, and by any mean necessary or into acting out in some manner, sadly, heinously, or worse, believe it or not. The capabilities of the technology defined in the Space Preservation Act, are known to be deployed by many methods which include portable systems and devices as well as versions which are handheld and also land, sea, drone, microwave tower and space-based. COINTELPRO mobilized efforts also reportedly play a pivotal role within communities in the form of police surveillance units using the technology nearby and also high on the list of victim’s detailing how these operations harassment intensified up close and personal. And, a person can be added to “The Program” for any reason. The foundation and objective are human testings. That is why victims are never told any allegations, ethically, morally and are denied even basic Human Rights. The Milgram Experiment proved that if asked by authority figures, by Yale University Stanley Milgram, people are compliant and will do as they are told without question. Milgram hoped was to understand why so many followed Hitler and destroyed human lives without conscience or remorse. Anyone, again, can become a test subject and victim of this specific type of covert targeting and, again, for any reason under the Sun. Below is a link to President Clinton’s attempting to apologize for radiation testing in a program that lasted well over 20 years involving numerous organizations (from the 50s thru 70s) and of which laid the foundation for what is happening today. What no one is reporting, media, etc., is that mind control testing did not stop with the Church Committee Hearings and has been an ongoing agenda for decades and that Project MK Ultra apparently went underground and continued to flourish. Today it has evolved into a heinous high-level testing effort so horrific that many can’t believe it exists. Trust that those involved will go to great lengths to keep what is happening and that which is now reported as the “Crime of the Century” again, cleverly, strategically, well-hidden. This has worked to allow the continuance of literally dirty work for a salary, and human monsters by calling evil good. Knowledge is power, awareness is key, TRUTH a very powerful weapon which ultimately will prevail. Stay strong victims. Please don’t give up! We are going to win!